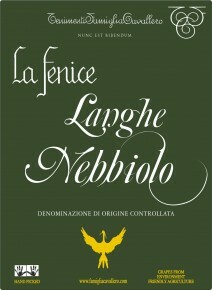 Nebbiolo La Fenice is essentially a declassified Barolo made from 100% selected nebbiolo grapes and it is an approachable wine at an approachable price. The bouquet is typical of nebbiolo, with elegance and harmony of aromas of red fruit, violet and rose followed by more complex notes of vanilla, cinnamon and green pepper. Full-bodied and rich on the palate it is sure to accompany well robust dishes of pasta, meat and aged cheeses. The clusters are hand-picked in late October. The vinification process rigorously follows the production code. A 10-15-day fermentation at 27°C ensures that the wine will extract generous tannins and extracts necessary for a sturdily-structured wine that must have lengthy cellaring potential. In the spring, the wine is transferred to large oak botti, where it matures for at least one year (sometimes more depneding on the vintage).